Dry Hair. Dandruff. Split Ends. When your hair reaches rock bottom it's time for a little rehab. 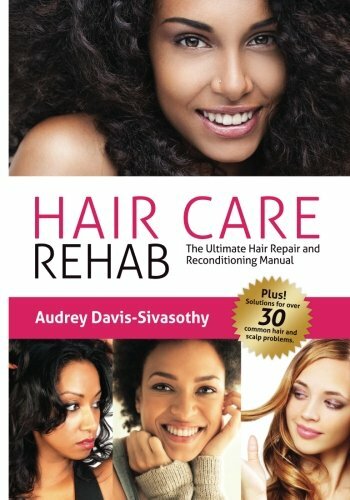 While we can't permanently undo the damage of the past, Hair Care Rehab: The Ultimate Hair Repair and Reconditioning Manual will give you the blueprint and tools you need to salvage and work with your stressed out hair. Who is this book for? Everyone! Brunette, blonde, straight, wavy, curly, thick, fine-- no matter your hair situation, rehab has you covered! This book takes readers through three phases of rehab: The Intervention: Discusses hair structure, type and form. Also defines hair damage, and teaches you how to work with overworked hair! The Detox: Presents a 5-Step strategy for hair repair that WORKS! Hair Therapy: Offers tips and solutions for 30+ common scalp and hair care issues. If your relationship with your hair is on the rocks, get the rehab you need today with Hair Care Rehab. Contents: Unit I: The Intervention Chapter 1: Let's Start Off With What Is Not True Chapter 2: Hair & Scalp: Just the Basics Chapter 3: Damage Defined Chapter 4: What s Your Drug of Choice? Unit II: The Detox Chapter 5: Getting Damage under Control Unit III: Hair Therapy & Treatment Chapter 6: The Hair Repair Manual Special Topics Alopecia (Hair Loss) Basic Hair Breakage Burns (Appliances) Chemical Burns Chlorine & Pool Water Damage Color Fading Contact Dermatitis Cradle Cap Crown-Area Hair Breakage Damaged, Highly Porous Hair Dandruff & Dry Scalp Dry, Brittle Hair Eczema Red, Itchy Scalp Fine, Limp Hair Frizzy Hair Graying Hair Green Hair Hair Loss & Thinning Head Lice Heat Damage Oily Hair Psoriasis Ringworm Seborrheic Dermatitis Shedding Single-Strand Knots Sluggish Hair Growth Split Ends Sun & Surf Damage Tangly Hair Thinning Hair Edges Thin Ends Unit IV: Outpatient Therapy Chapter 7: Special Hair Conditioning & Restoration Treatments Chapter 8: On the Shelf!